Bet Angel - FAQ's : I can't get watch list alerts to work. So I've set up some alerts and they play sound files and show messages in the log as expected. But I'd like to use watchlist alerts. 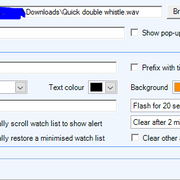 I've set these up, but nothing appears on the watchlist when the alerts go off. What am I doing wrong? Have you enabled the alerts to be displayed in the Watchlist? No. I read this viewtopic.php?f=61&t=18303&start=1 and there was no mention of it. I've now done so. I'll see if it works.